Samsung does not merely intend to gain market share. Since the tycoon has unveiled Samsung Galaxy Note 8.0 which is said to specifically rival against Apple’s iPad Mini at Mobile World Congress 2013, Samsung’s ambitions of replacing Apple iPad and dominating the whole tablet space seems to be more obvious. Now that Samsung Galaxy Note 8.0 VS iPad Mini closely resemble each other in many aspects, let’s have a detailed look of the two miniature tablets, and then you can easily draw a conclusion which one gains the upper hand. Below is the detailed Samsung Galaxy Note 8.0 and iPad Mini pros and cons review. 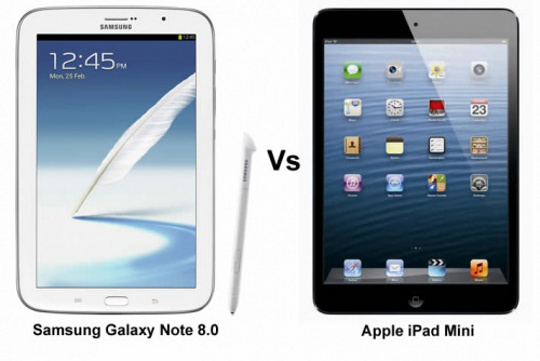 First of all, let’s start our Samsung Galaxy Note 8.0 VS iPad Mini review by comparing their external designs. The Galaxy Note 8.0 is a bit larger in every dimension, with the biggest difference being nearly 11 mm in height while the weight-difference between these two tablets is not really noticeable in the hand but the Note 8.0 does feel a little bulkier. Actually, the new comer of the segment, Samsung Galaxy Note 8, keeps the plastic back lid that received a lot of negative reviews while Apple’s iPad Mini excels with its premium-looking body and its solid construction. As to me, Samsung Galaxy Note 8 is a very odd tablet to look at while the Apple iPad Mini is more compact and better looking. Whatever, regardless this review about Samsung Galaxy Note 8.0 VS Apple iPad Mini, it’s your turn to make the decision. Galaxy Note 8 runs on Android 4.1 Jelly Bean and bets on Samsung’s proprietary Exynos 4 Quad chipset based on four Cortex A9 cores at 1.6 GHz and 2 GB of RAM, whereas the iPad Mini uses iOS 6.1 and imports the same Apple A5 chipset used in iPad 2 and the iPhone 4S. In other words, the Apple tablet is powered by a relatively slower 1GHz Cortex-A9 dual-core processor, a PowerVR SGX543MP2 GPU and 512MB of RAM. It seems that iPad Mini is losing the specs battle, but we shouldn’t forget that the iOS runs pretty smooth and glossy on this hardware platform. On the other hand, though Google’s Android has been coming on in leaps and bounds, it still lags far behind Apple’s iOS. In all honesty though, the iPad Mini currently has accessed to a wider range of tablet optimized apps that make the iPad line so interesting. If you’re into drawing, this Samsung Galaxy Note 8.0 VS iPad Mini review gives the iPad Mini gold award, despite its other shortcomings. The Samsung Galaxy Note 8 and the Apple iPad Mini are similarly equipped when it comes to battery capacity: a 16.3 watt-hour (4440mAh) battery fuels the iPad mini, which offers 10-hours of watching videos. On the other hand, a 4600mAh battery powers the Galaxy Note 8.0, which should not be an exception. With a big question mark over the price of the Galaxy Note 8.0, it's probably too early to give a definitive verdict here. But we'll have a better idea once we've fully reviewed the Galaxy Note 8.0 VS iPad Mini. Although the former isquite plasticky and odd looking, its better equipped better specs make up the shortcomings and seem more favorable. But if you are into design, content selection and build quality, the Apple iPad Mini is better suitable for your needs. Which one you’ll choose? Well, it really depends on what you’re looking for! 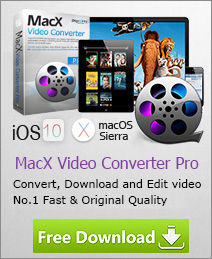 Still there is one thing for sure: both of the two tablets are solid choices to play DVD movies with the help of a DVD ripping software, no matter you bought the DVDs from Amazon or borrowed from DVD stores.